1 Halve vanilla bean lengthwise, scrape out the seeds and add pod to a pot with the sugar and vegetable stock. Bring to a boil. Remove from heat and let steep, covered, for 10 minutes. 2 Meanwhile, rinse asparagus, peel stalks with a peeler and cit off the woody ends. 3 Cut off asparagus tips and set aside in a small bowl. Cut asparagus diagonally into very thin slices. 4 Cut orange in half and squeeze 2 tablespoons juice into a bowl. Stir in vinegar, salt and pepper to taste and the oil. 5 Take vanilla pod from the pot. Pour broth mixture into juice mixture and beat vigorously with a whisk. 6 Mix in asparagus slices, cover and refrigerate for at least 1 hour. Meanwhile, rinse arugula, spin dry and cut off the thick stems. 7 Rinse strawberries in a bowl of cold water and gently dry with paper towels. Halve or quarter berries, depending on size. 8 About 10 minutes before serving, take asparagus salad from the refrigerator and allow to come to room temperature. 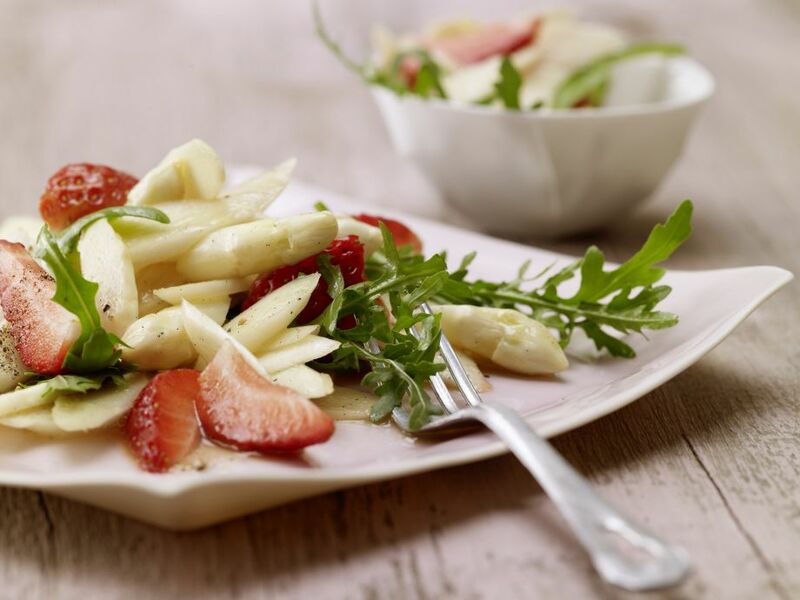 Fold the arugula and strawberries into salad, garnish with asparagus tips and serve.